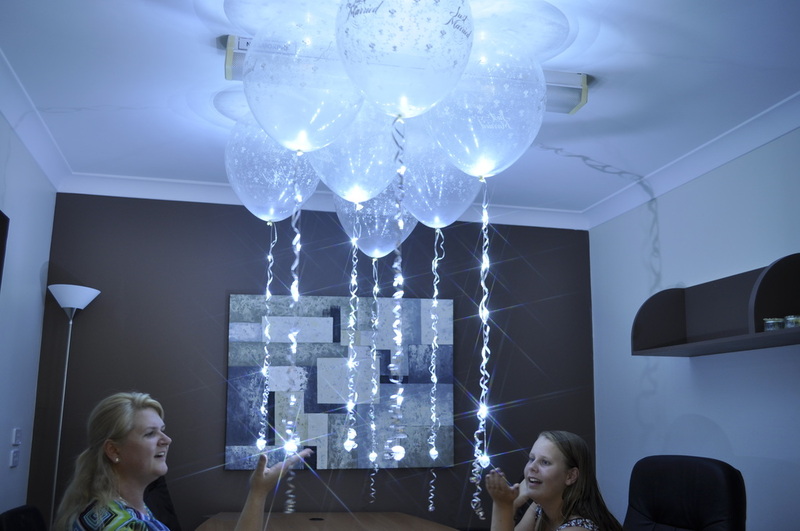 Below are some stunning ideas to create a "Sparkle Ceiling", simple and yet incredibly effective balloon ceiling scatters with Sparkle Collars, Sparkle Ribbon® and Party Dots® attached to, or inserted inside balloons. We call these "Sparkle Floaters' or "Sparkle Ceiling Scatters". Sparkle Collars on the necks of helium filled 30cm latex balloons with ribbons attached. We hi float them to last 24 hours or more. 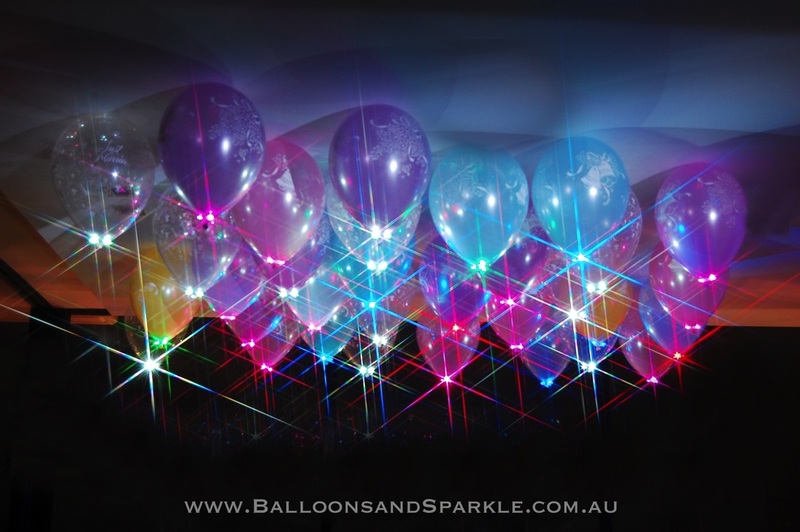 Here we have 25 helium balloons with a Sparkle Collar on every balloon in blinking or glowing. 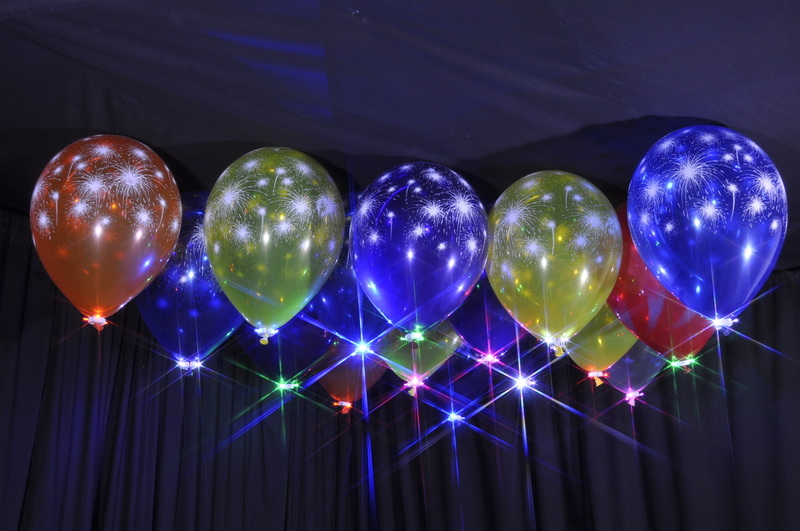 Sparkle Collars on the necks of helium filled 30cm latex balloons with no ribbons attached. 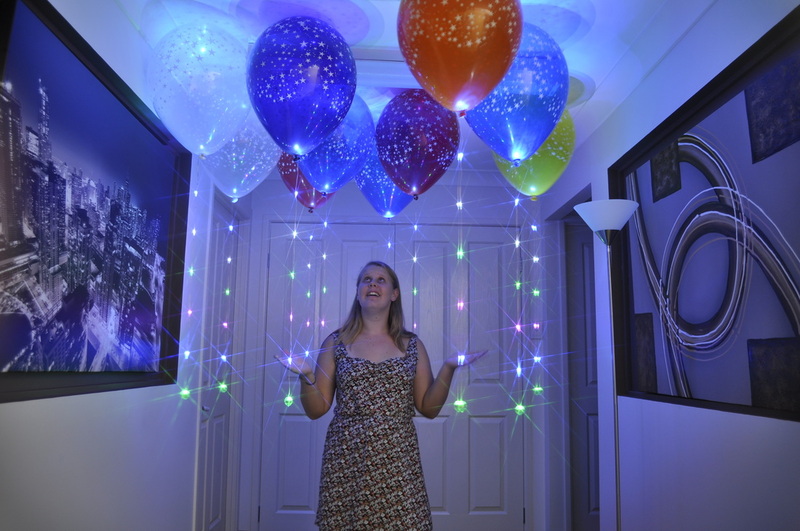 Here we have 20 helium balloons with a Sparkle Collar on every balloon in blinking or glowing. 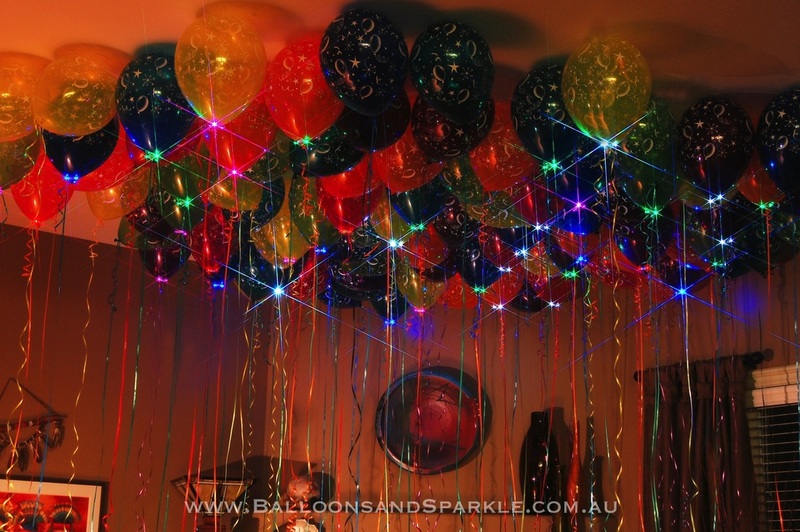 These are a mixture of 30cm and large 45cm helium filled latex balloons with Sparkle Collars on the 30cm and Sparkle Ribbon on the 45cm balloons, a Sparkle Ceiling Scatter mixture. $7.95 each for the Floating Sparkle Floaters with the Sparkle Ribbon attached. 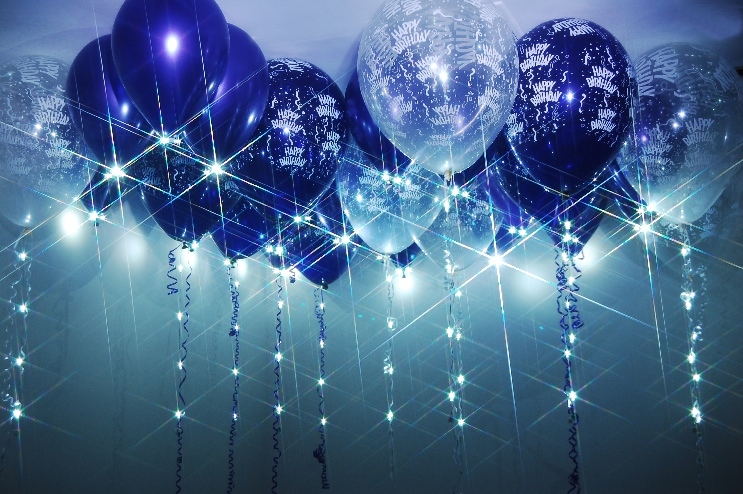 These are stunning clear large 45cm helium filled latex balloons with white Sparkle Ribbon attached to each balloon, to float them to the ceiling we must use the larger 45cm balloons. We add hi float to help them float longer for up to 48 hours, a stunning effect. Priced from $7.95 each helium filled. This really is gorgeous. Helium filled stars around 45cm large balloons with our multicoloured Sparkle Ribbon attached to each balloon and the ribbons removed. Just 10 balloons are pictured here and yet the effect is just beautiful. Hi float has been added to extend the float time. 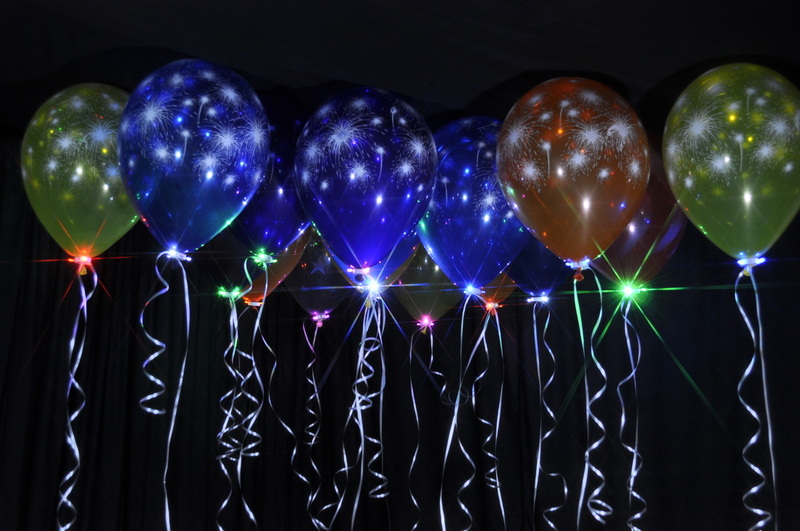 Priced from $7.95 per balloon helium filled. A room filled with balloons and Sparkle Collars on every 2nd balloon, not only a sea of colour but a stunning effect of lighting. We add long curling ribbons and of course we hi float the balloons so that they float for 24 hours or more. Priced from $4.95 per balloon with a Sparkle Collar & $2 per balloon with no Sparkle Collar. 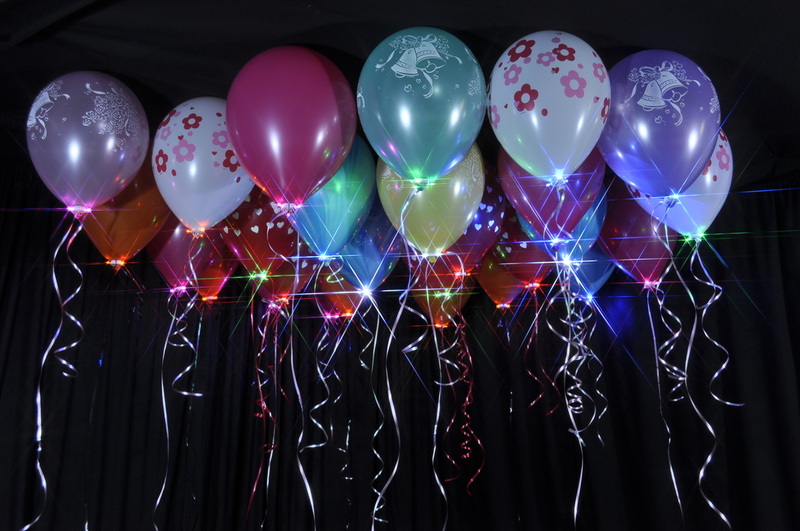 Beautiful pastel coloured 30cm balloons helium filled, these have a lovely wedding pattern printed on the balloons. We attached a Sparkle Collar to the neck of every balloon in white, pink, blue and green and it looked just beautiful. We add hi float to assist in extra float time. A little sparse, but still very effective. 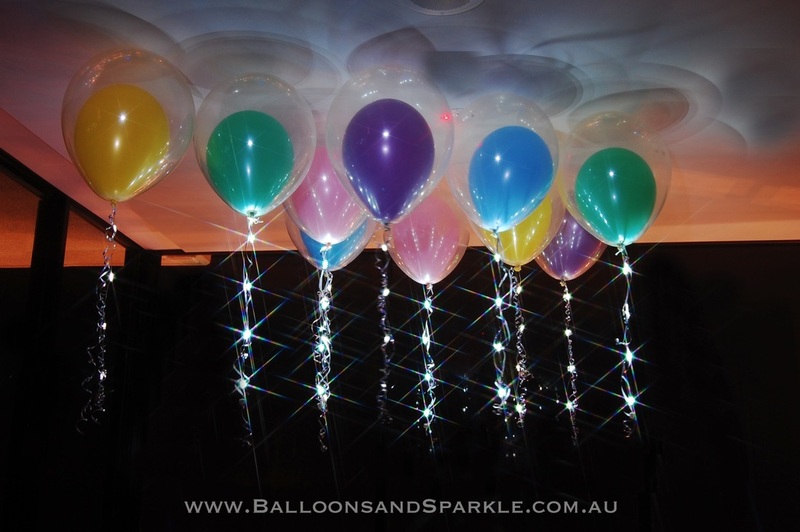 These are clear 45cm large helium filled balloons with a 30cm helium filled balloon stuffed inside as well. White Sparkle Ribbon is attached to each balloon, these will float for around 12 hours when helium filled, no hi float added to these. Priced from 9.95 per balloon double stuffed.